The company that would eventually evolve into Midland National Life Insurance Company was born on a late summer evening in the Black HIlls of South Dakota. 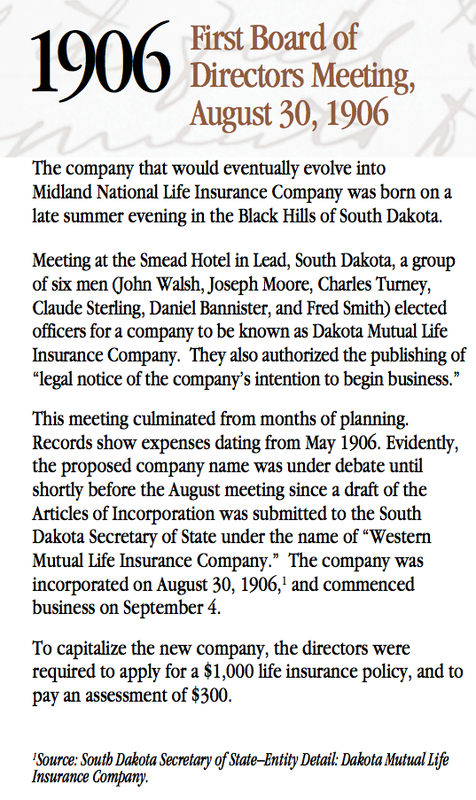 Meeting at the Smead Hotel in Lead, South Dakota, a group of six men (John Walsh, Joseph Moore, Charles Turney, Claude Sterling, Daniel Bannister, and Fred Smith) elected officers for a company to be known as Dakota Mutual Life Insurance Company. They also authorized the publishing of "legal notice of the company's intention to begin business." The meeting culminated from months of planning. Records show expenses dating from May 1906. Evidently, the proposed name was under debate until shortly before the August meeting since a draft of the Articles of Incorporation was submitted to the South Dakota Secretary of State under the name of "Western Mutual Life Insurance Company." The company was incorporated on August 30, 1906, and commenced business on September 4. To capitalize the new company, the directors were required to apply for a $1,000 life insurance policy, and to pay an assessment of $300.